On the subject of all things spooky, one of my favorite books as a kid was Spooky Tricks by Rose Wyler and Gerald Ames with pictures by Talivalidis Stubis. The copy I had was originally purchased through Weekly Reader book order forms by my babysitter before it was passed along to me. 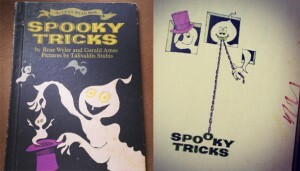 It features all sorts of creeptastic magic tricks that can be done easily at home. And I just adore the illustrations.